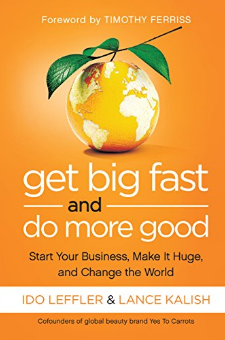 Get Big Fast and Do More Good is a guide to modern entrepreneurship and accelerated brand-building from the founders of Yes To Inc, the company behind the breakthrough natural beauty brand Yes to Carrots.Ido Leffler and Lance Kalish, two 29-year-old Australians with very different back-grounds and skills, cofounded their company in 2006 with little more than a dream—and made it big. Yes to Carrots has become one of the biggest natural beauty brands in the world and is one of the fastest-growing skincare brands. Leffler and Kalish have accomplished it all while maintaining solid principles, investing in meaningful business relationships, giving back to the community, and still making it home in time for dinner. The authors started their business with nothing but chutzpah and great instincts for products with potential. They’ve since made lots of great decisions and some really, really bad ones, and are ready to share their hard-won secret to success: a strong, resilient, trusting partnership coupled with a great sense of humor.